Very portable; Solid build; Responsive screen; Amazingly long battery life; Well-priced. Slows down while multitasking; Erratic touchpad; Scarce storage. We have seen quite a few Windows 8 'laptops' that come with touch screens which best utilise the Metro interface of the new OS (we expect many more such models to come out in the next few months). A rather new form factor - or device 'type' if you may - that has sprung up is a hybrid that can switch back and forth between a laptop and a tablet. The Acer Iconia W510 is one such Windows 8 'tablet' that snugly fits into a keyboard dock to transform instantly into a laptop. This Atom-powered device attempts to give you not only the best of both worlds, but also promises a healthy mix of performance and battery backup. Let's take a look. The W510 is actually a standalone tablet with all the essential computing hardware inside the screen, while the keyboard is only an accessory. Overall, the device sports faux aluminium looks, but is essentially made of a polymer with a matte finish that is resistant to dust and fingerprints. That said, it does look good with its rounded edges, and appears to be solidly built with no tacky moving parts. The tablet snugly slides into the keyboard accessory and snaps firmly into position via a trusty mechanical lock. which is secure enough to prevent accidental unlocking. Aesthetics have been paid attention to, as the white plastic sleeve encasing the locking mechanism doesn't appear out of place and is not too large. Once docked, the Iconia can open to even a little more than 270 degrees. The hinge is quite rigid and reassures us that it is built to last. While it looks small when closed with portable dimensions of 10.25" (l) x 6.6" (b) x 0.4"(1.1 cm) (h), it is surprisingly heavy at 1.30 kg. 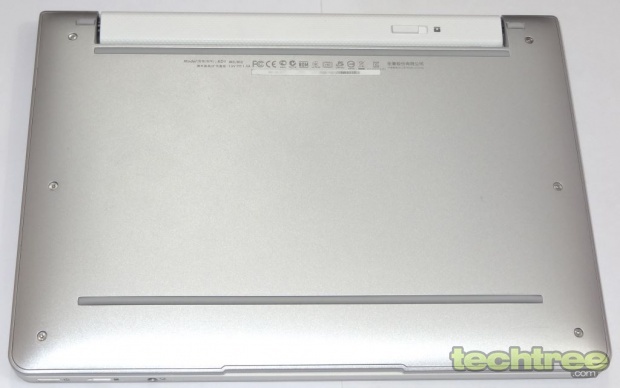 The tablet itself weighs a comfortable 0.6 kg, and the keyboard with a spare battery weighs 0.7 kg. The island-type keys are nicely spaced out with a gap of around 3 mm between adjacent keys, which helps distinguish between individual keys while typing. A keystroke of around 2 mm provides a satisfactory feedback. The touchpad has a nice feel due to the matte finish, and is reasonably large at 3" wide and 2" tall with a demarcated zone near the bottom containing the mouse buttons, although the left and right are visually indistinct. 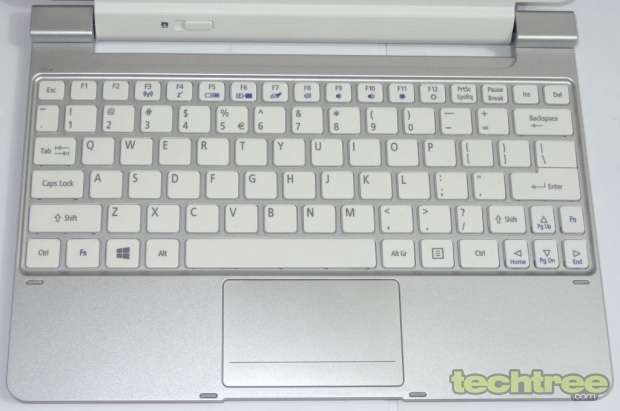 Also, the touchpad is located at dead centre (instead of the customary position of slightly to the left of the user), thus increasing chances of inadvertent inputs. The keyboard dock contains an extra battery that doubles the backup time, and also has a USB 2.0 port on its left. The battery is the reason why the keyboard half of the device alone weighs 0.7 kg, and adds to the weight of the device. The W510 tablet sports a 10.1" IPS panel with a 5-point capacitive touchscreen. It features HD-ready pixel dimensions of 1366x768. A capacitive Windows key is present at the centre of the bottom bezel, just like it is on Microsoft's own Surface RT. An 8 mp camera with LED flash is present at the rear, while a 2 mp front camera is situated on the top bezel. 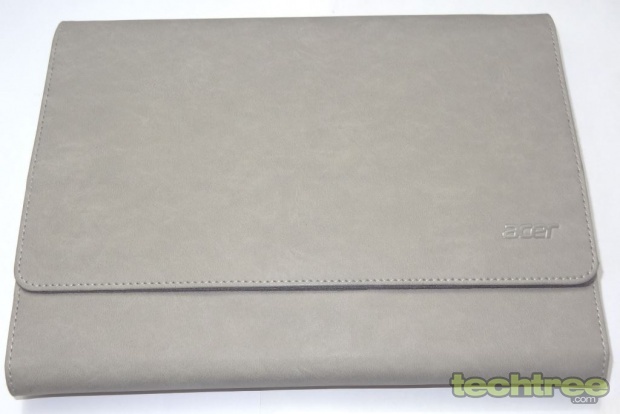 Acer has also provided a premium leather carry case for the laptop. On the hardware front, the W510 is powered by a dual-core Hyperthreaded Intel Atom Z2760 CPU clocked at 1.8 GHz, also known as Clover Trail. This is a 32-bit CPU, which places certain constraints such as only 32-bit version of Windows 8 can be installed and you can only have up to 4 GB of RAM, because only 3.2 GB can be accessed. In this case, there is 2 GB and it is not upgradeable, obviously because this is a tablet. This processor is supposed to be Intel's answer to the ARM competitor, providing good performance with a long battery life, and also being priced lower than its more powerful CPUs. While ARM-based tablets are not able to run all Windows programs, the Z2760 can do so as it is x86 compatible. It also supports Intel's special standby mode where it is practically off, but can still receive emails and even other alerts such as incoming Skype calls. A 64 GB SSD is present inside, although we must state here that only around 20 GB is left available for the user. Windows 8 Pro 32-bit version is installed on the device. A trial version of MS Office 2010 is also installed, which means that you will have to eventually pay for the full version or settle for a freeware office suite if it suits your purpose. ARM-based Windows RT tablets do have an advantage in this case as they come with a free version of Office Student/Home Edition 2013. The W510 boots up in around 20 seconds after the power button is pressed, which is not as fast as the 8-second boot-up time that we have usually come to associate with SSD-based Windows 8 notebooks. 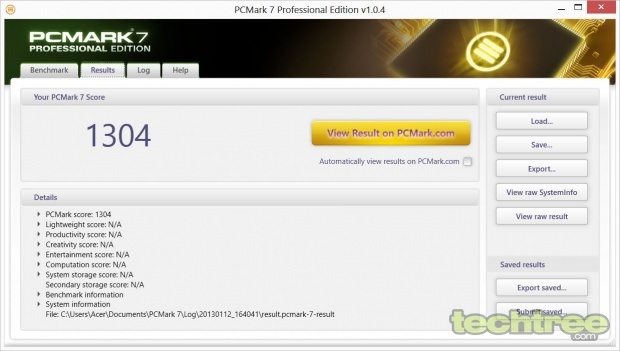 The overall performance is brisk even with antivirus installed and running in the background. The screen has excellent touch response with no detectable lag of any sort and is just as fast as that of the Apple iPad. 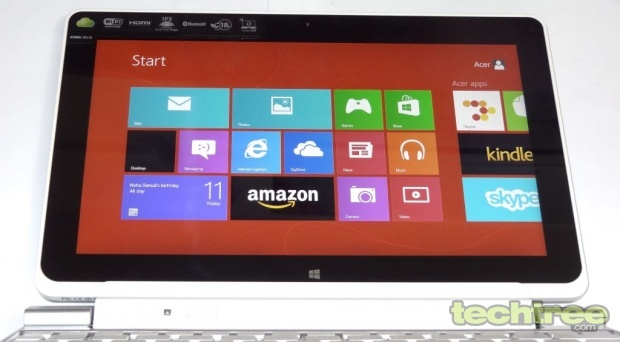 Windows 8 being an OS more inclined towards touchscreen devices, it is indeed a joy to use the OS on this laptop. Swiping across the screen, resizing, and shuffling between applications is simply child's play. Ergonomics, is taken due care of, as far as the keyboard is concerned even when the overall size is as small as that of a netbook. Unfortunately, we cannot say the same of the touchpad that reacts erratically to swipe inputs. The screen is not very bright even at the brightest setting and coupled with its glossy finish, is difficult to view outdoors and in bright environments. The viewing angles are not as great as one would normally expect of an IPS panel, with some discolouration setting in when viewed at around 150 degrees (but who would want to use a small screen this way is another matter altogether). However, it is still a lot better than most non-IPS tablet displays and doesn't hurt much for such a small screen size. While gaming is not its forte, it plays 1080p movies without missing a beat. The speakers are not loud enough and you will invariably need to use a headphone. While there are no ventilation grills, the W510 ran cool throughout the benchmark process. 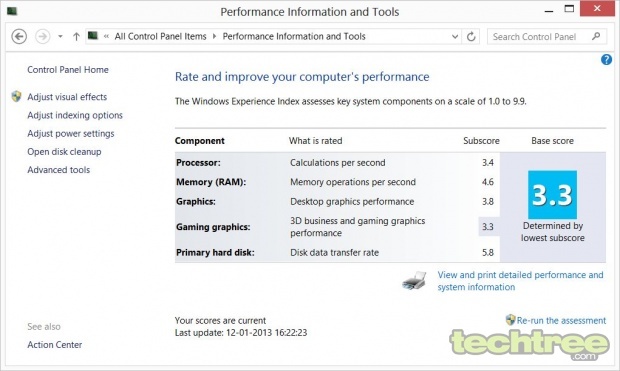 We conducted a few synthetic benchmarks to find out how the Aspire Iconia W510 performs. The benchmark results indicate clearly that the Iconia W510 performs quite well for an Atom tablet. It is easy to deduce that the device is perfectly capable of handling office tasks as well as multimedia, and casual gaming. However, excessive multitasking such as opening multiple programs and several tabs in browsers must be avoided as it slows down the system. We measured the battery life by Battery Eater Pro and also by actually using the laptop with the Balanced power scheme of Windows 8. The two tests run in Battery Eater Pro utility are the Reader's test which simulates real-world reading scenario, while the Classic test uses OpenGL rendering (3D simulation) to simulate heavy usage such as gaming. We were blown away by the results. A battery backup time of around 14 hours 10 minutes was registered (with both the batteries working) in the Reader's test, while the Classic test result was not bad either with just under 9 hours. The results with just the internal battery of the tablet for the Reader's test and Classic test were found to be 7 hours 40 minutes and 4 hours 50 minutes, respectively. In normal usage that involves using office applications, surfing the internet, occasional music and video, and watching some YouTube clips, the internal battery lasted for over 6 hours, while both the batteries together pushed the backup time further to over 16 hours, which is close to the claimed 18 hours. Overall, there is no room for complaint as far as battery backup of this Windows 8 tablet is concerned and it is definitely a gadget to carry with you without worrying about the battery giving up on you when you need it the most. 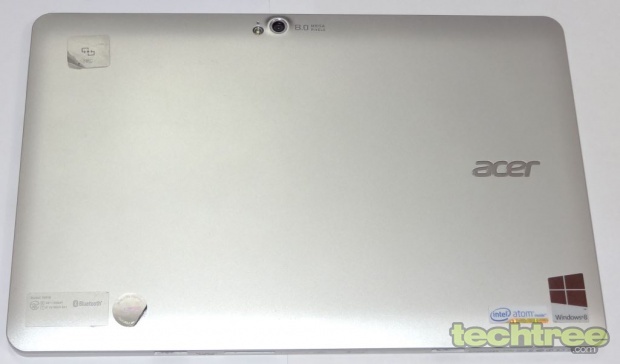 The Acer Iconia W510 is one of the first Windows 8 tablets with a convertible form factor that we have reviewed. Despite its Atom processor, it performs quite well and is good for office work. The IPS screen looks good and is very responsive. The build quality is very good. While its small size makes it very portable, its weight of 1.3 kg makes it surprisingly heavier than a standard netbook. Although there is a 64 GB SSD, there is hardly 20 GB free space available for the user and this might need to be augmented via microSD card. An exceptionally long battery life with the extra battery in the keyboard dock makes it a device that can be taken on a trip without having to worry about not finding a charging point. Priced at Rs 48,600, this is possibly one of the cheapest Windows 8 hybrid devices available in the market and we think it is worth a buy.